feels like an age since we made a new website. very happy that this is the one we make a small come-back with. 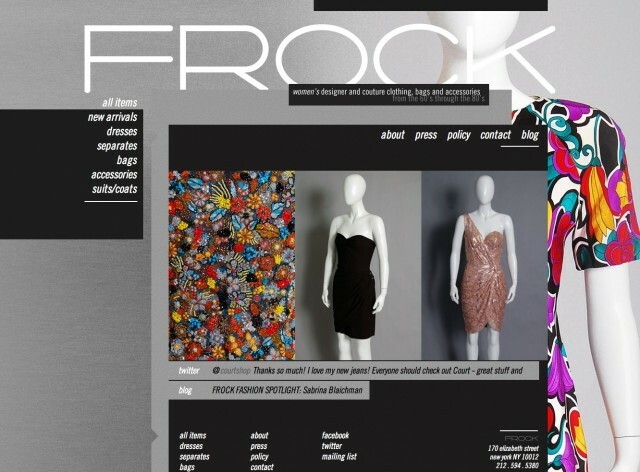 frock is a new york-based women’s vintage clothing store. we built this site using wordpress and shopify. both truly excellent and affordable platforms for building easy to use websites for clients. shopify in particular is a new discovery for us and we’re all about it now. so thanks to whoever put it in front of us. we can’t remember who that was sadly. thanks also to lexi + evan who run frock and are awesome to work with. the site itself was, believe it or not, inspired by the robert palmer video for addicted to love. trivia – these guys just outfitted the cast of men in black 3.
fact – you should probably tell your girlfriend about this website.